The type K was the last version of the Me-109. Indeed, postwar models like the Avia S199 and Spanish Buchon were so different that they are in no way related to the M109 line, with band new engines and tons of modifications. The Bf 109K was multiplication of kits and sub-variants of past F and G series, factory and field conversions which eventually made production and maintenance not only overly complicated but also costly, a real problem for production management Germany ill-afford late in the war. The RLM, under Alber Speer orders, summoned Messerschmitt to rationalise its production and take all improvements to produce a standard model interchangeable parts and equipments, making the production cheaper and faster. The RLM also pointed out the flaws in the airframe design and ordered these to be fixed for good. This process started in the spring of 1943, the prototype bing ready by autumn. Production started in August 1944, from the K-4 model (only mass production version, until the end of the war), the former pre-series nit equipped yet with the new Mercedes DB 605D engine. Deliveries from October 1944 reached 534 planes by main Messerschmitt A.G. plant at Regensburg (November), 856 in the end of 1944, for a total of 1,593 by the end of March 1945. This was a high rate of production despite allied bombings and continuous fighting. In fact only 314 K-4s were listed on active duty by the end of January 1945. Not all units would receive the Bf 109K. 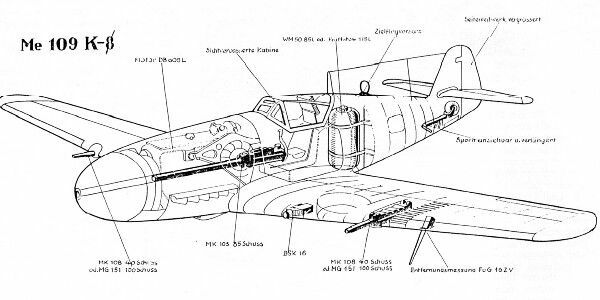 Modifications of the Bf 109 "Kürfurst"
Externally, there were changes on the fuselage: -Radio equipment hatch, moved forward and higher and D/F loop moved aft of the frames three and four. -The filler point for the fuselage fuel tank replaced between frames two and three. -Rudder fitted with the Flettner tab and fixed tabs. -Long retractable tail wheel with two small clamshell doors was added. -Large rectangular fairings for the new larger main wheels. -Oxygen bottles relocated from the rear fuselage to the right wing. The Daimler-Benz DB 605 DB/DC engine was introduced with the K-4, although the very first batch was still given the the earlier DM. This new engine had an adjusting screw, for using either B4 + MW 50 Methanol Water injection equipment or C3 fuel (DB 605 DB) with an optional MW 50 (DB 605 DC) booster. By combining the moderately high-octane B4 fuel with the MW 50, an emergency power rat of 1,600 PS at 6,000 m was reached, also traduced by a take-off power of 1,850 PS. The DB could run on higher octane C3 fuel but in that case, without the MW 50 booster. With that C3 fuel and booster however the engine can potentially rate as high as 2,000 PS, but it was restricted or forbidden. Nevertheless, using the MW 50 at maximum boost power, the Bf 109 K-4 became the fastest of the serie, reaching 710 km/h (440 mph) at 7,500 m (24,600 ft). Standard speed was 670 km/h (416 mph) at 9,000 m (30,000 ft) with an initial Rate of climb of 850 m/min without MW 50. This engine was mated to a wide-chord, three-bladed 3 m (9.8 ft) wide VDM 9-12159A propeller, the same as the previous G-6/AS, G-14/AS and G-10. Despite its excellent performances however, the 109 K-4 did not fare as well as previous G types which still had the privilege of veteran pilots, a rare occurrence in 1944-45. But the excellent performances of the 19 K did compensated a little for thes inexperienced rookies that were the former Hitler's youth that were trained on gliders and came of age. This was this abundance of novice, pitted against now largely allied veterans that caused such losses, just like for Japan. Most stayed as paper projects, up to experimentation is subjected to debate. The K-6 had on paper a completely revised armament, two 13 mm (.51 in) MG 131 above the engine hood, 30 mm (1.18 in) MK 108 Motorkanone but also an wings-mounted MK 108, substituted by 20 mm MG 151/20s. Armour weight was also increased to 90 kg (200 lb). Apparently prototypes tested at the Erprobungstelle Tarnewitz centre (Baltic coast). Perhaps the most advanced was the K-14, high-altitude heavy fighter with reinforced airframes (some delivered to II./JG52, Major Wilhelm Batz, late spring 1945). They only retained their 30 mm (1.18 in) motorkanon was to be fitted with a two-stage supercharged DB 605L engine and a four-bladed propeller. Top speed was to be 760 km/h (470 mph) at 12,000 m (39,000 ft).